Director Martin Scorsese’s first stab at a family film couldn’t have gone better. “Hugo,” based on the 2007 picture book “The Invention of Hugo Cabret,” is a beautifully rendered work that’s appropriate for children, yet possesses more emotional and thematic depth than the majority of films for adults. In other words, “Hugo” may be marketed as a family drama, but it shouldn’t be pigeonholed. 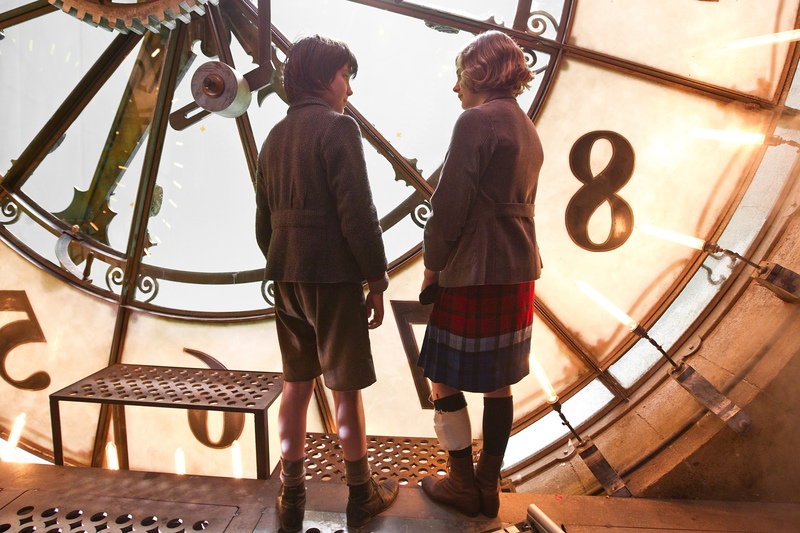 The plot is centered on Hugo (Asa Butterfield), an orphan who lives in a Paris train station, secretly caring for its clocks and stealing food to survive. In his spare time, he works to repair a complex automaton that his deceased father – a watchmaker – brought home. In order to make the repairs, Hugo is forced to steal parts, and he is caught in the act by a grumpy shopkeeper played by Ben Kingsley. For Hugo, this is a nightmare because he’s never more than a few steps from foster care. The store owner does not simply turn Hugo in, however. He is a complex man and his relationship with the boy becomes the central focus of the film. Scorsese presents the story lovingly, allowing his actors plenty of time to develop their roles and letting cinematographer Robert Richardson make the most of every shot. On video, the film is being released in multiple formats, including Blu-ray 3D, and those who have the equipment should watch with glasses on. “Hugo” is a great movie in any dimension but Scorsese isn’t merely dabbing with 3D. He uses it to give the film depth and meaning and, in one memorable scene, he transports viewers through the clockworks that Hugo calls home. Butterfield is strong in the title role, and he benefits from excellent supporting work by Kingsley and the movie’s large ensemble cast. The players include Sacha Baron Cohen, Chloe Grace Moretz, Ray Winstone, Emily Mortimer and Christopher Lee. All are excellent. At this point, nobody should be surprised to hear that the film is great. Oscar voters nominated it for 11 Academy Awards, including best picture, best adapted screenplay and best director for Scorsese. The hype is deserved, and movie lovers will do well to see “Hugo” as soon as time permits. The DVD-only release has no extras, but the Blu-ray and Blu-ray 3D sets come with several making-of features. It’s been eight years since the bumbling British spy Johnny English graced movie screens, and this sequel starts by revealing that the one-time hero has disgraced himself. When viewers first see the cast-off secret agent – played by gifted comedian Rowan Atkinson – he is studying martial arts with Tibetan monks. Despite having disastrously blown a mission in Mozambique, English is called back to duty by the British secret service and charged with unraveling an assassination plot. Because English is essentially a buffoon, he goes about his work with a mix of ineptitude and unearned self-assurance. Fortunately for him, the agency has also assigned a smart junior agent named Tucker (Daniel Kaluuya) to the case. Together these two make ground on the mission, despite English’s inadequacies. “Johnny English Reborn” could have been called “Johnny English Remade” or “Recast,” as the film doesn’t deliver anything new. As with it’s predecessor, the feature is essentially a sendup of the James Bond movies, and it owes a great deal to the long-running “Pink Panther” franchise. That’s not to say the film lacks charm. Despite its derivative nature, “Reborn” has a lot of fun, goofy moments, and Atkinson makes the most of everything from one-liners to silly sight gags. Director Oliver Parker knows enough to get out of his star’s way, and he does just that. This is Atkinson’s show from beginning to end. DVD and Blu-ray extras include deleted and extended scenes, a gag reel and an audio commentary by Parker and screenwriter Hamish McColl. “Justice League – Doom”: The latest DC Universe Animated Movie is based on Mark Waid’s comic book story “JLA: Tower of Babel.” In the 77-minute animated film, all members of the Justice League are in peril because a group of supervillains have discovered plans that Batman drew up for the purpose of stopping fellow heroes should they turn bad. Using Batman’s tactics, villains like Bane, Metallo and Cheetah are deadlier than ever. That leaves Superman, Wonder Woman, Flash, Green Lantern, Martian Manhunter and Cyborg in the fight of their lives. The talented voice cast includes Nathan Fillion, Tim Daly, Michael Rosenbaum and Kevin Conroy. “Todd & the Book of Pure Evil” – The Complete First Season: First 13 episodes of the Canadian TV series about a group of high school students who set out to destroy a book with the ability to grant any wish. Why would they want to destroy it? Because the book fulfills the wishes in a horrifying manner that often results in bloodshed. Alex House, Maggie Castle, Bill Turnbull and Melanie Leishman star. “The Manions of America”: DVD release of the 1981 miniseries that gave Pierce Brosnan his U.S. acting debut. Brosnan stars as Rory O’Manion, a 19th century Irishman who leaves his home country in hopes of a better life in America. Kate Mulgrew, David Soul and Linda Purl also star. “Redakai – Conquer the Kairu – The Journey Begins”: Thirteen episodes of the new Cartoon Network animated series based on the trading card game by the same name. The show focuses on three friends who travel the globe looking for an alien energy source. “The Angry Beavers” – Season 3, Part One: Thirteen episodes of the Nickelodeon animated series about beaver brothers attempting to live crazy bachelor lives in an Oregon forest. The voice cast includes Richard Steven Horvitz, Nick Bakay and Charlie Brisette. “Bounty Hunters”: Action film featuring wrestling star Trish Status as Jules Taylor, leader of a team of bounty hunters who capture a mafia informant. At first this seems like a good thing because he has a $100,000 bounty on his head. But when Jules refuses to turn the informant over to the mob, she and her team are attacked by assassins. “Answers to Nothing”: The search for a missing 11-year-old Los Angeles girl causes the lives of several strangers to intersect. Dane Cook, Elizabeth Mitchell, Julie Benz and Barbara Hershey star. Co-written and directed by Matthew Leutwyler. “Enemies of the People”: Documentary film about the genocide committed by the Khmer Rouge regime in Cambodia during the 1970s. The film is particularly interesting because co-director Thet Sambath’s parents and siblings were among those murdered. Hugo is very good and a work of art (best use of 3D I’ve ever seen). I did think it was a little slow for little kids, also some pretty intense scenes and emotions for young kids. Good acting throughout. I liked the little vignettes, went with the silent movie theme of the year. Funny how themey Hollywood is. I thought it might be slow for kids, but my boys – age 10 and 7 – really liked it. Cool. Kids are more mature in their movie-going than I used to be. (I was scared by the wicked witch in Wizard of Oz and by the scene in Pinocchio where he gets turned into a donkey!). I think for Hugo it was nice to go to a movie where the theater really helped. The 3D was so good.